So this is something new to me – the triple slow cooker! When I received the book “Triple Slow Cooker Entertaining” for review, I thought triple slow cooker party planning just meant I was borrowing slow cookers from my mother-in-law and sister. 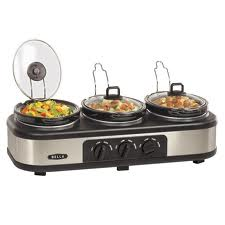 I had no idea they actually made single slow cookers with three crockpots! Say what?! So because I don’t own one of these, I will still be borrowing slow cookers from others to make multiple slow cooker dishes for one party, but I love the idea of this. All the prep is done, there is hot food for people like my hubby who think a raw food diet is a rare and bizarre form of torture, and there’s plenty of variety! All you need to add are a couple quick sides dishes and you’re set, for everything from Valentine’s Day to New Year’s Eve to Halloween. Of course, there are plenty of recipes that aren’t part of the 3-dish party plans, and any of the dishes can be made alone, so having only one slow cooker doesn’t make this book off-limits. 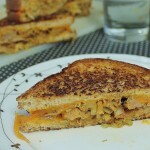 There are a number of recipes that use a lot more processed store bought products than I’d usually recommend, but since the idea here is fuss-free, easy party planning and execution, it makes sense. I get hungry just thinking about the Bacon Cheese Fondue with my soft homemade pretzels – perfect party food. The recipes I’m sharing today are part of Moore and Wyss’s recommended Mother’s Day combination, and with that lovely day just around the corner, it seemed a perfect time to share them to get all of us motivated. 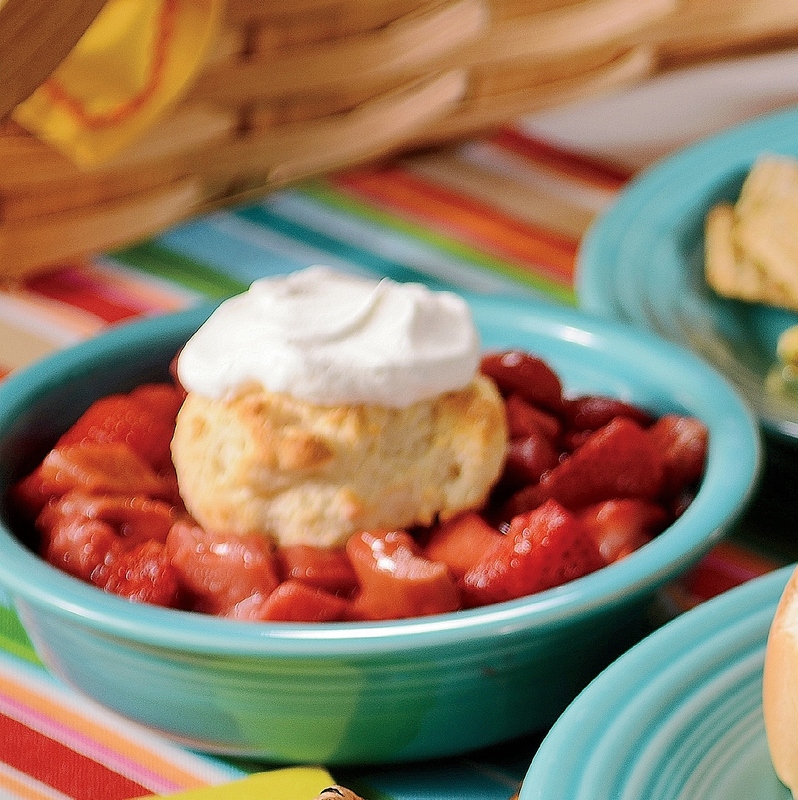 I especially can’t wait to try this strawberry rhubarb dessert – I adore rhubarb, and in this recipe the fruit is cooked in the slow cooker and a quick pie crust “dollop” is baked in the oven biscuit-style and set on top of the warm fruit mixture! That’s my kind of pie. And the hot corn dip? You can make just about anything warm and cheesy and I will dip my chips in it, and that’s a fact. This dip looks no different. As for the shrimp, this would be an easy dish for any weeknight, and could just as easily be done on the stovetop as in the slow cooker. 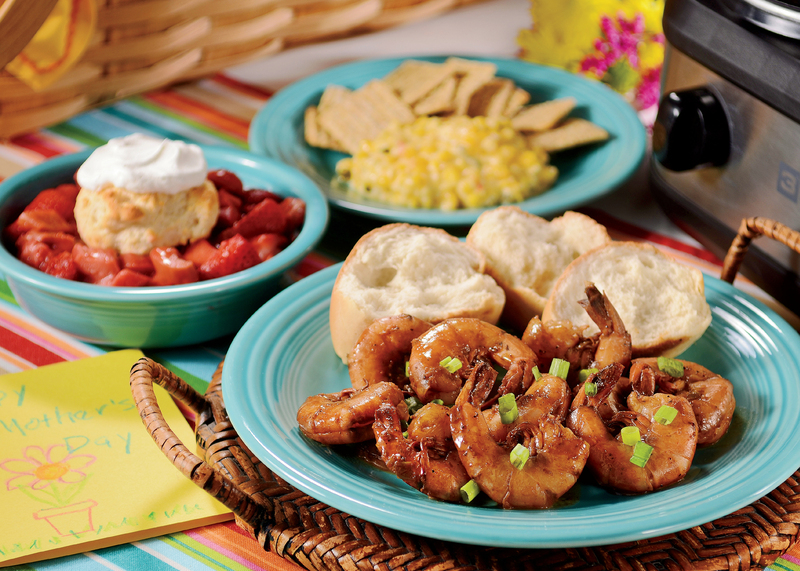 Which of the 3 would you like to try first – hot corn dip, New Orleans spicy BBQ shrimp, or strawberry rhubarb dessert? Or do you have a triple slow cooker so you can try all 3 at once? Do you have any Mother’s Day dinner plans or is it not an occasion you spend much time celebrating? This unique appy dip makes about 5 cups. 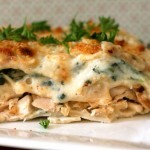 Serve with your favourite tortilla chips! Spray one slow cooker stoneware with baking spray. In a medium bowl, combine corn, green chiles and jalapeños. Stir in Cheddar-Jack, Parmesan and mayonnaise. Transfer to prepared stoneware. 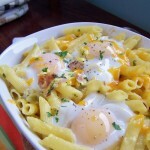 Cover and cook on High for 11⁄2 to 2 hours, stirring once every hour, until cheese is melted. Turn to Warm for serving. Make Ahead: Prepare dip through step 2, cover and refrigerate overnight. Cook as directed. When people from Kansas City say “barbecue,” they usually mean ribs or brisket. New Orleans, on the other hand, is known for its spicy barbecued shrimp, cooked with the shells on to maximize flavor. To serve in classic fashion, cover the table with newspaper and provide plenty of napkins. Shrimp sizes vary quite a lot by the region, so our large shrimp may not be the same size as yours. 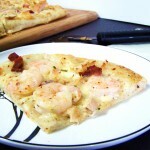 This dish is best with large to jumbo shrimp, about 16 to 20 per pound (500 g). If you have smaller or larger shrimp, adjust the cooking time as needed so that they do not overcook. 1. In one slow cooker stoneware, combine garlic, Cajun seasoning, butter, Worcestershire sauce, hot pepper sauce and lemon juice. Season to taste with salt and pepper. Cover and cook on High for 30 minutes or until hot. 2. Rinse shrimp and drain. Spoon about half the sauce from the slow cooker into a heatproof measuring cup or bowl. Place shrimp in the sauce remaining in the stoneware. Drizzle with the reserved sauce. Stir to coat evenly. 3. Cover and cook on High for 30 minutes or until shrimp are pink, firm and opaque. Turn to Warm for serving. Sprinkle with green onion just before serving. Dollops of dough, baked like biscuits or scones, make the crust for this dessert. It reminds Kathy of cobblers her mom and grandma used to make when she was growing up. If desired, top each dessert with a dollop of sweetened whipped cream or a scoop of ice cream. Create a shortcake-like dessert by slicing each crust dollop in half and topping the slices with the strawberry-rhubarb mixture and whipped cream. 1. Spray one slow cooker stoneware with baking spray. 2. In a medium bowl, combine strawberries, rhubarb, sugar, flour, cornstarch and salt. Transfer to prepared stoneware. 3. 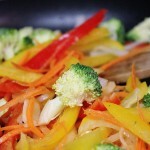 Cover and cook on Low for 4 to 5 hours or on High for 2 to 21⁄2 hours, until fruit is tender. Turn to Warm for serving. 4. About 30 minutes before serving, preheat oven to 400°F (200°C). 5. Crust: In a medium bowl, whisk together flour, 3 tsp (45 mL) of the sugar, baking powder and salt. Using your fingertips or a pastry blender, cut in butter until mixture resembles coarse crumbs. Using a fork, stir in cream until a soft dough forms. 6. Divide dough into 8 dollops and place about 2 inches (5 cm) apart on baking sheet lined with parchment paper. Sprinkle the remaining sugar evenly over dollops of dough. 7. Bake for 18 to 20 minutes or until golden brown. 8. To serve, spoon fruit mixture into bowls and place a crust dollop on top of each. Serve warm. 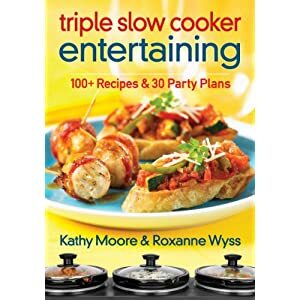 Excerpted from Triple Slow Cooker Entertaining by Kathy Moore & Roxanne Wyss © 2013 Robert Rose Inc. www.robertrose.ca May not be reprinted without publisher permission. Recipes and photographs used here with permission. *Full disclaimer: I received a copy of this cookbook from the publisher for review. I was not otherwise compensated for this post. All opinions are, as always, completely my own.